Peripheral equipment to assist with energy conservation and steam system optimization. 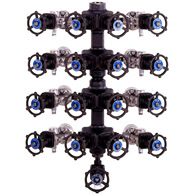 A line-up of various types of peripheral equipment to assist with energy conservation and optimization of pipework. Used for the recycling of condensate, surplus steam, etc. (flash tanks, steam condensing heat exchangers). Branches and convergences of tracing and steam mains (manifold).